Mike Byrne considers himself primarily a marine artist, painting mainly in Acrylic. However, he is versatile and has explored other subjects and other mediums such as watercolor, pastel and pen & ink stipple. Over the years photography has become another strong interest. In 2009 Mike was commissioned by the Royal Oak Historical Society to illustrate the organization’s calendar with stipple art drawings of Royal Oak historic treasures. Mike was awarded South Oakland Artist Association’s “Artist of the Year” award for 2009. Mike Byrne has lived in Royal Oak most of his life. His first real introduction to art was at Shrine High School where he won awards in woodcarving. Mike attended the Meinzinger Art School, then went to Society of Arts and Crafts (which is now The College of Creative Studies) and finished at James Cotton Commercial Art School. While in the U.S. Navy he met and married his wife, Michele. In 1966 Mike started a 40-plus year career in the advertising field with companies such as Burroughs Corporation, Rose Jewelers and Highland Superstores before opening his own advertising agency. In 1990 Mike found renewed interest in the fine arts with marine watercolor paintings which he has exhibited throughout Michigan. 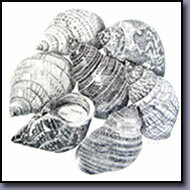 Soon he developed a desire to apply his graphics knowledge of printing and ventured into stipple art, using a very fine rapidiograph to produce pen and ink drawings, primarily in marine art. Mike is a member of the Royal Oak Arts Council, The South Oakland Art Association, The Detroit Marine Historic Society, The Great Lakes Lighthouse Keepers Association, and The National Maritime Historic Society.